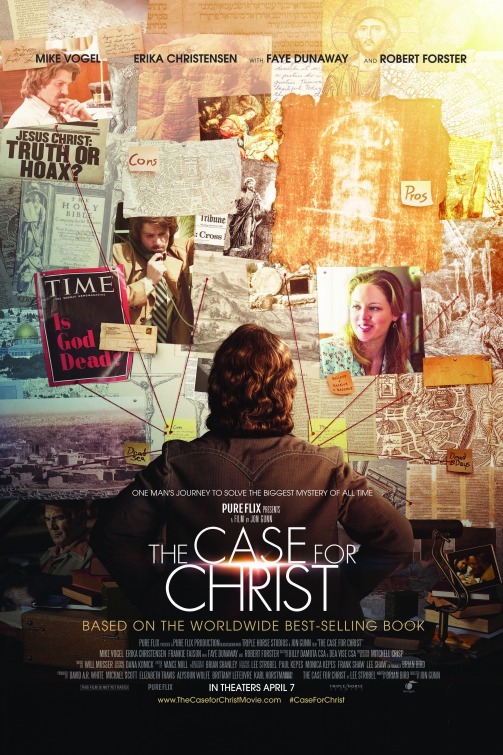 I was led to believe from some of the reviews I had see for The Case for Christ that this film did not fall into the traps that other faith-based films fell. Unfortunately, I have to disagree with that. Journalist Lee Strobel (Mike Vogel) and his wife Leslie (Erika Christensen) were out at dinner with their daughter when she began choking on a piece of candy. Calling out for help, Rose from LOST (L. Scott Caldwell playing a nurse called Alfie) came to their aid. After saving the little girl, Alfie said that she and her husband hadn’t intended on coming to this restaurant, but said God had brought them to this restaurant instead. Lee and Leslie were admitted atheists but Alfie’s words brought feelings up in Leslie that she did not expect. She began to turn to Christianity. Lee remained a skeptic and found the sudden change in their status quo causing troubles in their marriage. Lee decided that he would do what he did best… investigate Christianity with the intent of disproving the resurrection of Jesus, something that he found more difficult to do as he proceeded. Now, I think there could have been some really interesting story options here. How the differences between a believer and a non-believer would affect a marriage, especially with the sudden change from atheist to believer, is a fascinating dynamic and it would be interesting to explore the idea without judging one or the other. However, this film immediately casts judgment on Lee, making him jealous of Leslie’s newfound relationship with God. He then begins a downward spiral turning him into a hot mess during his investigation, going as far as making him fail at his job at the newspaper. This couple showed no signs of having any problems prior to the daughter choking so all of this came after Leslie’s change of perception. The other interesting concept that this film used was the actual investigation into Christianity, but this is very one sided as well. Every “expert” Lee talks to is condescending and approaches the subject through the eyes of their own biases. The film needed to balance the investigation with some experts for Lee’s side as well, to make the journey feel more true to life. There was a scene with one of the experts in a debate about this very topic. That debate would have been a great addition to this movie. It was not included to make sure that the other side did not receive the proper consideration. The Case for Christ was not completely terrible, but it did not break the issues faith-based films have, and it could have been the faith-based film that accomplished that feat. If you liked the other faith-based films of the last several years, then this will be another one for you.